Originally from India, her journey with colors and design started in New Delhi where she completed a 3-year Diploma in Textile Design. While in India after finishing her course she gained some experience of freehand painting on silk and chiffon sarees which was like creating an art on a large canvas! Ruchi traveled around the world with her husband and explored different landscapes and cultures like Greece, Italy and Japan to name a few. In 1994 she moved to Australia with her husband to start a settled life and family. The amazing Australian landscapes and ocean and the rich and colorful textiles of India have been the main source of inspiration for her artworks in terms of color and the softness and transparency of chiffon. Ruchi mainly works with acrylics, washes and sometimes ink. She believes art is a way to express feelings and emotions that we feel towards people, nature and this beautiful earth that we live on. Ruchi has been exploring with acrylics as she believes they are very versatile and easy to work with in terms of creating textures, depth and blending techniques. Ruchi believes in spontaneity and free flow of strokes. Each piece is started with some visual understanding of its flow and direction and as it progresses it takes its own path and slowly develops its own character, story and depth. 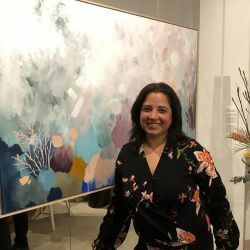 Ruchi has been painting full time for the last three years and her paintings have been well received by Private collectors in Australia and overseas.